There could be many reasons for October release...Maybe that’s the time slot that they got for the premiere in max cinema halls. They might look for other MVs being released at the time? One can only make a guess with limited knowledge of the steps involved. But, at least it’s this year..
take a good break to enjoy herself and her family , and comeback with another great project, my preference another movie. Maybe in 2021( lol! Do not kill me). There is enough time to relax, travel, do MV promotions AND go through scripts....AND pick one. So, I feel very optimistic of seeing her again later in the year in a drama..
1:We waited 2 yrs for her drama and didn’t get to see her enough in MOA. Fans deserve a gift of drama from her. Also, a drama which would be a good promo for it too. since it’s going to take some time to catch up so will first answer your questions.. Though knowing SJJ who follows the rule of unpredictability & path least trodden...I should choose a different option..
but I will be going against what I think.. The upcoming thriller Call will star Park Shin Hye and Jeon Jong Seo. This duo has been gathering attention through the “Concept Visual” which has added expectations to the movie. Call depicts the story of two women living at different times and are connected through phone calls. Park’s character, Seo Yeon, lives in the present while Kwon Sang Hye, played by Jeon, will be the woman who lives in the past. Unexpected events begin to arise from the telephone calls the two leads receive. Kim Sung Ryung will portray the mother of Seo Yeon. Lee El, Park Ho San, Oh Jeong Se, and Dong Ki Ri completes the powerful lineup that will bring life to the gripping story. Lee El will take on the villain role in the film, acting as the mother who watches every move of Young Suk. We have all witnessed the transformation of Park Shin Hye in different genres so this will be yet another feather on her cap. Her new film calls attention because of the intense visuals and will be undoubtedly the most remarkable thriller of 2019. Rookie director Lee Chung hyun, whose debut film swept the world’s leading film festivals through his short film ‘Ransom’ will direct Call. They are scheduled to start full-scale shooting in January next year. The film Call will be released in 2019. Actress Park Shin Hye shows rich acting in various works on the big and small screens and she is working together with actress Jeong Jong Seo who shot straight to the top with the movie “Burning”. Yes, the trailers, script reading videos all are exciting. The script reading moments does show a good rapport between the cast. It sure will translate well onto the screen as well. @alcides14ahjumma..Yes, everything looks very promising from all fronts. It’s 16 ep drama. I think its highly unlikely to be extended because of it’s AR theme that requires lot of post filming work too. Let’s just hope to enjoy exciting 16 ep of an outstanding drama. @jongski....It’s anybody’s guess as to how many scenes we’ll be seeing from Spain and other places. Logically, it does seem a possibility to see a lot because of the name of the drama, filming in 4 places in Spain ( Granada, Barcelona, Terrassa, Girona) for more than a month there. But, they’ve been to Yoguslavia and Slovenia too. They’ve been filming in Korea (Paradise city, Golf courses etc) since returning from abroad filming...It is expected to continue until November so definitely we will see scenes from Korea too. maybe outdoor scenes would mostly be from other countries? These would all be conjectures. On October 7, tvN released the first script reading for upcoming drama “Memories of the Alhambra” on their official YouTube channel. 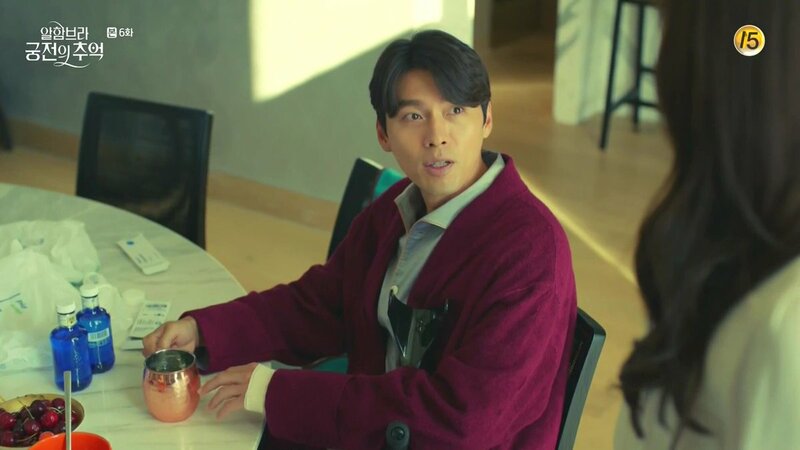 The video shows Hyun Bin getting into character as investment company CEO Yoo Jin Woo, looking fierce and assertive. Park Shin Hye shows off her character, Jung Hee Joo’s clumsy and unique personality as she makes the whole cast burst into laughter through her lines. EXO’s Chanyeol plays Jung Se Joo, Jung Hee Joo’s trouble making younger brother. The mysteriousness of his character is shown through the way he slyly and subtly delivers his lines. if there’s any empty rooms and being flustered at Park Shin Hye’s response that there are no rooms except for a single room on the sixth floor, with the catch being that the elevator isn’t working. She then recommends him to find another place to stay. The two characters bicker back and forth and their relationship slowly progresses as they start wondering more about each other’s strange personalities. The rest of the cast also get into their characters as they read their lines with passion. [OSEN = Reporter Kim Bo Ra] Actresses Park Shin Hye and Jun Jong Seo have confirmed their participation in the thriller "Call" (director by Lee Chung Hyun, distributor NEW, producer Yong Film). On October 2, producers and distributors of the film revealed, "Park Shin Hye and Jun Jong Seo have confirmed that they will star in the thriller "Call." Park Shin Hye, who is showing various charms in both movies and television dramas, and Jun Jong Seo, a rising star in the movie industry through "Burning" (2018), will collaborate in this new work. "Call" is a horror movie that revolves around the story of two girls who live in two different times and are connected through a phone call. As a Hallyu star, Park Shin Hye has shown her excellent performances in many aspects such as drama, CF, etc. Over the past period, she has held the position of a charming actress and proven her steady acting ability through "Culano Agency" (2010), "Miracle in Cell No.7" (2012), "The Royal Tailor" (2014), "My Annoying Brother" (2016), "Heart Blackened" (2017), etc. In the movie "Call," Park Shin will play Seo Yeon, a woman living in the present. Although Seo Yeon encounters unexpected events after by chance receiving a call from the past, she is always strong-minded. Park Shin Hye is expected to show a more mature and deep performance through this role. Jun Jong Seo made a splendid appearance when taking on the role of the female lead in "Burning" by director Lee Chang Dong. She received critical acclaim for her unique charisma in acting as well as her prominent presence. In the movie "Burning," Jun Jong Seo showed her fresh and outside-the-box acting style, making the audience expect her to join in the next work as soon as possible. In the movie "Call," she will play the role of Young Sook - a girl living in the past. Jun Jong Seo plays the role of Young Sook, who believes that the phone call accidentally connected to the future is the only hope to save herself and does not hesitate to make a risky choice. It is expected that Jung Jong Seo will have a passionate performance and bring new images to the viewers. Lee Choong Hyun, who directed “Call,” is a brilliant young director who has surprisingly emerged as a promising factor in the movie industry Chungmuro. He swept the world’s leading film festivals with his 14-minute short film “Bargain.” This new movie will be his first feature-length film. "Call" is produced by Yong Film, the company that has produced movies in a wide variety of genres and contemporary scripts such as "Beauty Inside" (2015), "Luck Key" (2015), "The Handmaiden" (2016), "Heart Blackened" (2017), "Believer" (2018), etc. The movie is invested and distributed by NEW. With the production stage and casting having been finished, the movie is expected to start filming in November. Titled 'Call', the upcoming production is garnering attention not only for its talented, two main actresses casting, but also for being one of Korea's first films led by actresses without a lead male actor. 'Call' tells the story of two women who are living in different time periods, but who receive a mysterious call that connects their lives together. Rookie actress Jeon Jong Seo, who rose to fame through director Lee Chang Dong's 'Burning', plays the role of Young Sook - a woman from the past who is willing to make dangerous decisions in order to save herself in the future. Opposite her, Park Shin Hye is Seo Yeon - a strong-willed woman from the future willing to help the woman in the past. Marking rookie director Lee Choong Hyun's first ever full-length movie production debut, 'Call' is set to premiere sometime in 2019. There is dearth of one of a kind plot but SJJ can always be trusted to come up with a totally unique and creative one. With AR theme thrown in ...it becomes totally pioneering. The comment below reaffirms that. Excrept from Park Shin Hye’s Vogue Taiwan IV....relate to the drama.. Please share with us the character of the role in the tvN new drama "Reminiscences of the Alhambra"? What kind of play is this play? This play is about the fantasy story of the character played by the actor, Hyun Bin, who happened to live in the old hotel I operated. In the play, I am a girl who is very strong in life and willpower. This is a little different from the role that the audience has seen me in before. The character "Jung Hee Joo “ I play is a very cute girl. I am working hard to shoot, I hope everyone supports and loves. One of the happiest or most moving things recently? No matter where I am always supported by my fans, I am most moved and happy! I used to see there were fans watching me in Spain.They heard the news that I went to Spain to film...the fans, or the Korean tourists who happened to meet me. I am very grateful to them. Because of them, I feel that my heart is very warm. Note: please excuse any errors in my understanding in google translation of the article..
Seo Yeon is a woman who lives in the present. Although she encounters unexpected events after receiving by chance receiving a call from the past, Seo Yeon is always strong-minded. Young Sook, is a woman who lives in the past. She believes that the phone call coincidentally connected to the future is her only hope at survival and does not hesitate to make dangerous choices.